Phillip Hoose is the author of five books, including the Christopher Award—winning It’s Our World, Too! For more than twenty years he has been a staff member of the Nature Conservancy, working to protect habitats of endangered species, including ants. He is a founding member of the Children’s Music Network and a guitar player in The Hoose Family band. For more information about Phillip Hoose visit www.heylittleant.com. Hannah Hoose is an actress, dancer, keyboardist, and student in Portland, Maine. She has appeared in many productions for the Children’s Theater of Maine. 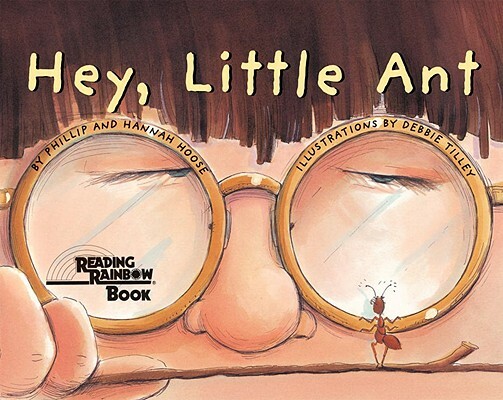 Hannah was nine when she and her father wrote “Hey, Little Ant.” In performance, she plays the child who raises her foot up over the insect, played by her father. This is her first book. Debbie Tilley’s other books include Dinosaur Dinner, Riddleicious, Riddleightful, and Oops! She lives in southern California with her two cats, Vinnie and Howard, and Millie the dog.